With Cynthia Rowley's home collection, you'll knock the entire process of buying home decor out! You'll even do it with confidence as her releases add the final touches to your home's interior design scheme. When it comes to shopping for home décor, there are no hard and fast guidelines or binding rules. But, we all would want to know what interior designers, the experts on home décor, define as a perfectly styled home that’s Instagram or Pinterest worthy. Fortunately, Cynthia Rowley, an American fashion designer, released a home collection which is inspired by her love of entertaining. Her collection includes end tables and coffee tables - plus hostess gifts, from shower curtains and throw blankets to high-quality, luxurious duvet cover sets. What we love about Rowley's home collection is the fact that it makes shopping for home accessories and decorations feel less daunting or overwhelming. Keep on reading as what we have below are tips and tricks on how to look for the best items to sprinkle or add to your home. Check them out! The most important thing you need to remember when choosing between different products from Cynthia Rowley's home accessories collection is to have the right dimensions written on a piece of paper. It may be the dimensions of the empty space in your foyer or living room or the surface area of your kitchen countertop. The fashion designer suggests to keep notes and have them with you when you are shopping. That way, you don't make the excruciating mistake of buying home décor that's too wide or too small. Never break the bank when you're shopping for home furniture and décor. Cynthia Rowley said homeowners should find things that are stunning, yet affordable. They allow you to be more confident around your home. What it means is that you won't have to tiptoe in your home because you're not afraid of using the items you've bought as you can easily replace them. Also, there is no use of having something around the house that you'll worry about at all times as it might break or get soiled. You'll just learn to hate it instead of being happy of its impact within your home. Now that you know how to make the buying process simpler, take a look at some of the home décor items from Cynthia Rowley's collection that have been flying off the shelves lately. Hypoallergenic, breathable, and durable – if you are on the lookout for a three-piece duvet cover set that's both indulgent and luxurious, then go for Cynthia Rowley's Moroccan Bedding. It's a set that's made of microfiber light enough that you'll be kept cool during hot summer nights. During the winter season, it'll keep you warm enough that you will stay toasty and not roasting. Since its material is 100% polyester, it works in regulating your body's temperature. 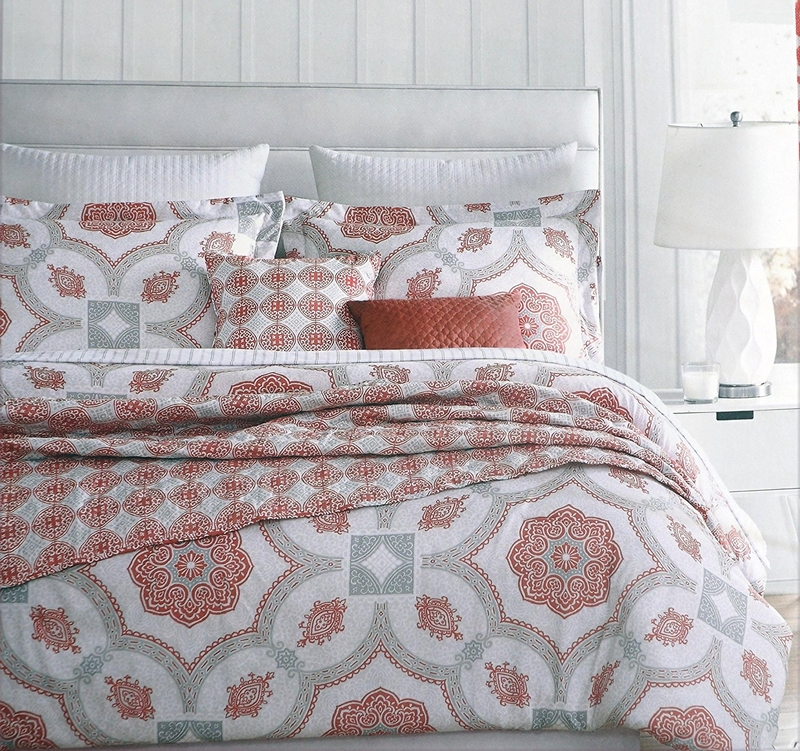 Introduce luxury into your bedroom with Cynthia Rowley's quilt cover set. Made with 300 thread count cotton, it is guaranteed to feel silky soft and smooth against your skin. It's fluffy, moisture absorbent, and remarkably light to provide you with the best bedding for a good night's rest. If you're on a budget but you'd still want a set that's made of high-quality materials, you'll never go wrong with this one. Although throw blankets are difficult to judge objectively, we've tried out dozens of throws but everyone in the office gravitated to using the Mongolian Lamb Faux Fur Blanket of Cynthia Rowley even when it's not showy in terms of design. What we particularly loved about it is the fact that it has a homey color and it's incredibly soft. Also, it's easygoing, which means it's perfect to wrap around you while you sit or curl up with a loved one. As a best-seller, this floral fabric shower curtain by Cynthia Rowley is surprisingly soft. It has a beautiful print and a modern design, perfect for adding a touch of brightness and class to a bathroom. It's also machine washable for quick and easy cleaning. With this shower curtain's 4.7-star rating on Amazon, you know you'll never be let down by this easy-to-use and fabulous cotton/polyester bathroom addition. Do you love lounging in the comfortable and cushy beds of upscale hotels? We know we do! Give your bedroom a luxurious vibe similar to that of hotel rooms with this 100% cotton duvet cover from Cynthia Rowley. It's not the cheapest set of covers, but it is worth investing in your sleep quality and home décor! Cotton isn’t just long-lasting and durable, but it is also extremely cool and comfortable, too. Given its price, Cynthia Rowley's Twin Peak Lighted Display Stand is among the best-lighted display stands on the market right now. A room that's fitted with this incredible display cabinet will look put together, and you'll even be impressed of how attractive and sturdy it is. It's fitted with lights which make it all the more tempting as it makes collectibles visible. Lastly, it boasts of a convenient weight that makes the unit stable, yet not too heavy. Are you in need of some luxury added to your space? If so, then this Flirt Coffee Table from Cynthia Rowley is the way to go. With its shaped legs, sleek surface, and Mother of Pearl inlay, this coffee table exudes a contemporary vibe with classy accents that just bring about that much-needed lustrous detail. We're labeling this one as an excellent investment piece. A durable end table can last several years. If you are on the lookout for a piece that's going to retain its beauty and color for a long time, then Flirt End Table of Cynthia Rowley is your best option, most especially if you're set out to spend a bit more for a high-quality piece of furniture. With its elegant design, you'll receive myriads of compliments on this new living room addition. Make an upgrade with Cynthia Rowley's Floral Window Curtains if you want high-quality window treatments. This set of 2 is well-made and it has a pattern that's capable of blocking out most of the light out during nighttime. During the day, you'll be able to let the sun come in and brighten up your living space. Not all throw blankets have been created equal, and Cynthia Rowley's Brown/Ivory Machine Washable Throw is certainly a cut above all the rest. With its 100% polyester faux fur material, it can add a touch of flair to your reading nook or bedroom, making it a striking choice. While it is built for style rather than sleeping, we love how its design works with nearly any décor.